1. Contact our support at https://aithelp.com/Tickets/Submit and give both your current registration name and your desired new name. It is recommended to use Latin characters only in your registration name. 2. Once your registration name is changed, you will receive a response from us, along with a special script, which will allow you to "De-register" your database. 3. Please uninstall Translation Office 3000 from your computer, then install it once again. Run Translation Office 3000 and register it with your license code. You will receive a message about a license name mismatch in your program and database. Click OK.
4. 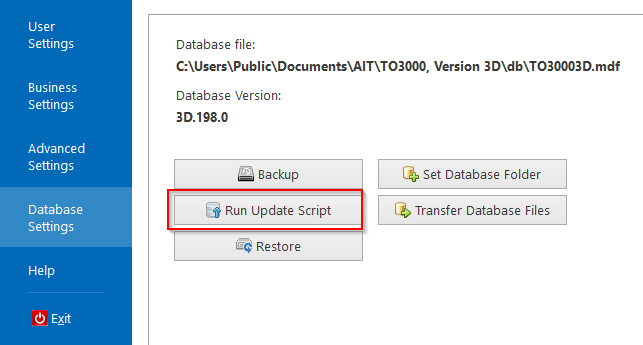 Go to "Database settings >> Run update script". Copy-paste the reset script into the folder with the other scripts and run it. Restart TO3000. Your registration name should now be updated. Note: Be very careful about who has access to the reset script. If you do not plan to change your registration name anymore, we recommend deleting the script from your machine.